The alstromeria is native to South America, and is found growing wild in the Andes. The name comes from a Swedish baron, Baron Claus von Alstromer, who discovered the seeds while travelling Spain in the mid-1700s. The seeds were no doubt brought back by Spanish explorers who travelled to South America during the Age of Discovery (15th to early 17th centuries). The alstromeria shape is reminiscent of a miniature lily and they are often referred to as the Peruvian Lily or Lily of the Incas. This flower is symbolic of wealth and prosperity, and is also the flower of friendship. The petals are usually striped, giving them a wonderful textural interest and the florets come in a wide range of colours; yellow, apricot, orange, salmon, pink, red, mauve, lavender, purple, cream, white and bi-colours. Sadly this heavily hybridized flower no longer has a fragrance. While researching the alstromeria, I learned something that I had not noticed in the entire time that I have been playing with these flowers – the leaves grow upside down, with the leaf twisting as it grows out from the stem, so that the bottom is facing upwards. Maybe I hadn’t noticed this because I actually remove most of the leaves when cleaning the stems. I have found that they become tired looking and bedraggled quite rapidly and thus tend to make an arrangement quickly age in appearance. Sometimes I do leave a few of the smallest leaves that are closest to the top part of the stem because they add an interesting textural element to the arrangement. However, if I’m creating a vase piece using only alstromeria, I remove all foliage, leaving only the lovely lily shaped flower – of which there at least 6 per 2 foot long stalk – and the long leggy straight stems, which I twist to give a beautiful curved line when placed in the vase. I also discovered that the alstromeria continues to grow in a floral arrangement, very much like a tulip does. Alstomeria continue to look fresh for up to 3 weeks if cared for with regular changes of water and floral food. This was a really fun little piece to make (see photo at beginning of this blog), inspired by the all-important and oh so classic gourd of the autumn season – the pumpkin. Variations of texture and shade are very important in a monochromatic colour scheme, like the orange I have chosen for this arrangement. The smooth glossy surface of the vibrant orange pumpkin contrasts beautifully with the multi shaded orange petals of the altstromerias. Additional elements include the tiny spots of red orange of the rose hips and the velvety burnt orange of the mums. When it comes to greens or foliage in a monochromatic floral design, there seem to be two thoughts – either the green doesn’t count because all plants have green bits and so you just ignore the green, or the green bits count and it isn’t a monochromatic arrangement is there is any green (unless of course the colour scheme is green). I choose whichever thought best suits my design, so decided to use the green of the tiny curved leaves on the alstromeria along with some sprigs of rosemary from my garden for additional textural interest to complete this festive arrangement. Slice off the top of pumpkin and clean out the insides. 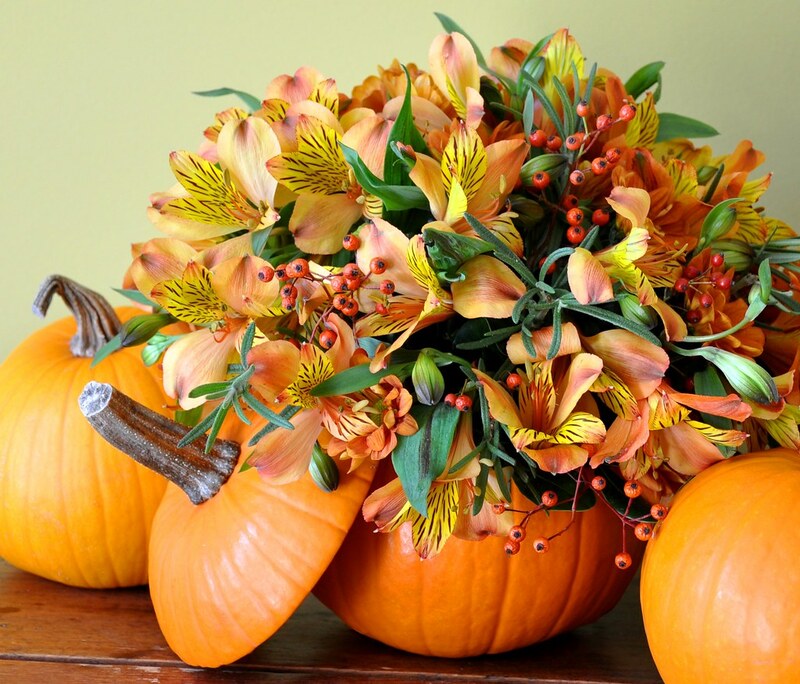 Soak floral foam in water treated with floral food and cut to fit inside pumpkin cavity. Stick 2 short skewers into floor of cavity and position foam securely onto skewers. Stick 2 skewers into pumpkin lid and attach it to the edge of pumpkin. Form the outline of the arrangement with 4 mums – 1 vertically in the centre to determine height and 3 around the base to give width. Consider the length of the alstromeria floret stem when determining height/width and cut the mums to the shortest alstromeria stem length. Remember you will be pushing the stems into the foam at least 1 – 1.5”. 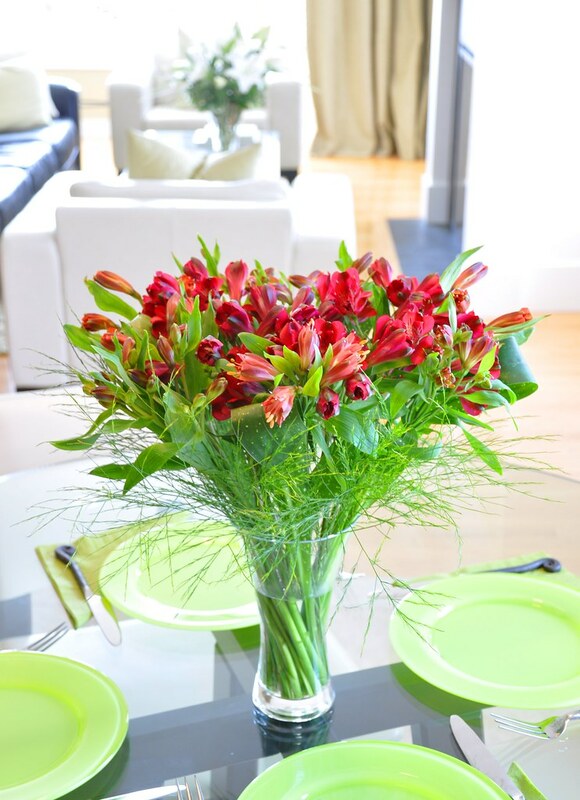 Fill with alstromeria florets that have been cut off the main stalk – about 5 – 6 from each stalk. Pop in a few mums here and there. Fill holes in the design with rose-hip branches and sprigs of rosemary. Top up the cavity with water that has been treated with floral food. Thought for the week: However beautiful the strategy, you should occasionally look at the results. This entry was posted in Floral Arrangement, Floral Design, October and tagged alstromeria, Floral Arrangement, florals, florets, Flowers, gerbera daisies, hand tied bouquets, lant, lily of the incas, peruvian lily, petals, vase arrangement, versatility, wealth and prosperity. Bookmark the permalink. Both comments and trackbacks are currently closed. You’ve inspired me (yet again)…I think I’ll try the “recipe” with faint hopes that it will look even close to your beautiful arrangement. Glad this has inspired you Ann. I’m sure you will do a wonderful job of creating your own version of this arrangement. I bet you and Ella would have fun making this Rachel.